Lion Country Safari to put up Purple Martin Housing!!! When I started my business, the whole idea was to convince people to put up housing for Purple Martins. I thought it was tragic the plight of this bird, though NOT endangered, depends on us so heavily for its survival. The housing boom of the last few years seemed to have left Purple Martins in the dust as new, cookie cutter communities with strict HOA’s seems to be placing an emphasis on pristine neighborhoods and frowning on bird poop. So back to when I started my website, it was mainly to express my love of Purple Martins through my art and show people what a cool, relaxing, family-oriented hobby, being a Purple Martin Landlord can be. Well, the site may have evolved, but I still had the desire to convince others that a close encounter with nature could be right in their own backyard! I had called and spoke to a fantastic lady called Brenda Irvine, the Animal Curator at Lion Country Safari and told her what a great location they had for Purple Martins. We met and looked at several great spots that would be great areas to attract Purple Martins. She pitched the idea to the powers that be and Lo and Behold, they decided to purchase an CUEnt 12 unit Purple Martin Gourd rack and 12 Troyer horizontal with SREH tunnels! 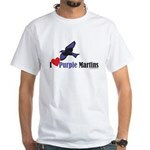 They are very excited to help Purple Martins in Florida and I am glad that they decided to help too. Now my Purple Martin babies will have some where to disburse to! The starlings won’t be a problem with the SREH (Starling Resistant Entrance Holes) but the English House Sparrows (HOSP) may be. I offered to help them with trapping, if needed. I will keep you all updated on their site! I wanted to let you all know that I had long term plans to place a web/nest cam on my site. Though the linking in to my site is still in development, I have started a streaming webcam of my site PurpleMartins-R-Us.com. This BirdCam site will eventually (I hope) have LIVE streaming video of my colony site. I will also keep you updated on that. But check back and I will keep you up to date with that also. 2009 – Here We Go!!! As Purple Martin season draws near I find myself torn between preparing for my birds return on one hand and preparations for “everything else” on the other. My birds returned on January 29 last season and I have the sneaking suspicion that they will be earlier this year. It always seems odd that Purple Martins arrive so much earlier on the West coast of florida. Why would one little Lake (Okeechobee) hold up my birds for an additional month? I should be grateful for the extra time. Especially this year. My 4 year old son started going to pre-K only 3 months ago. And in that time we have all endured the flu twice. My 2 boys also have suffered through a sinus infection, an ear infection and a never ending runny nose. So running outside to gather pine needles is low on the to-do list. But it had better make its way to the top soon. Being sick has delayed the preparation of many things. I am in the process of trying to gather information for a database of South Florida Purple Martin Colonies and have been placing flyers on mail boxes of homes that have martin housing up. On January 21st I will be going to the 2009 Space Coast Birding and Wildlife Festival in Titusville for 4 days. I will be giving 2 presentations on Purple Martins along with tending to my exhibitor booth. I am planning on being at the Folke Peterson Wildlife Center on Jan10 for the “Call Of The Wild” event, again to give a presentation and run an exhibitors booth. Then add all the web site development stuff I have undertaken, I still need to buy the cement for the ground stake, and get my new CUENT gourd rack up. I had planned on increasing my capacity this year but I may have to be satisfied with a slight increase. Last year I had 12 gourds and 7 compartments in my house. I had about 85% occupancy. This season I plan on slightly increasing gourds offered to 17 and 6 compartments in a new Sunset Inn house. I MAY be able to add a live webcam this year and somehow integrate this feature in my website PurpleMartins-R-Us.com . One thing I DID get to do was put another coat of paint on the “little repeating nest trap that could”. The paint may be the only thing holding this trap together at this point. The wood is warped, but the lines on this house were never straight to start out with. My husband is still in shock that it actually works and it was proven again when last week I put the trap up. I had thought I heard a Starlings wolf whistle amongst a large flock of Grackles. Long story short the “little trap that could” did not catch the starling but the next morning I awoke to find another Eastern Screech Owl in the holding cage. Off you go little guy, go get some sleep. We are Purple Martin Landlords!!! Sometimes I believe that the essential thing that sets us apart from other animals is that we define ourselves. We have some sort of conception of who we are. Who are you? By even asking the question we show that “Who” is an essential and fundamental part of our life. Speaking for myself, I am always in flux on “who I am” at the moment. Most of the time, to my husbands chagrin, I am a “mom”. I try to keep “wife” close to the top of the list, but it seems that as I get older, instead of figuring out “who I am” more clearly, I discover that there are more layers to me than I ever knew existed. Of course I am sometimes things I don’t want to be. For example; I have no desire to be a psychologist but between my family and my kids, I feel like I am constantly either wearing a white coat or feeling like I want to put someone in a straight jacket. When I am up till 3 AM painting in one of my crazy artistic compulsions, I am an artist…but when I wake up the next morning at 6AM with the kids, I REALLY wish I was not. Of course, many of you reading this define yourself (as do I) as a Purple Martin Landlord or Steward. This feels like a relatively new role for me that I am remarkably happy about. Though being a Purple Martin Landlord isn’t a job, it can often feel like one with all the blood, sweat and tears we put into it. But it’s not that hard. It comes naturally. I mean geez, it’s not brain surgery. It’s not an exclusive club that requires decades of experience before you can lay claim to basic knowledge. Being a Purple Martin Landlord is a mix of passion, real interest, concern and love for a blue-ish black bird with a slightly forked tail. Being a Landlord doesn’t require battle scars, but you will get them. Being a Landlord doesn’t require admission or acceptance from any club, organization or group, only from those same birds we seek so desperately. Being a Purple Martin Landlord doesn’t require a degree/diploma or certificate, only the ability to constantly seek out these birds and the answers that will help us to help them. I am a Purple Martin Landlord. And I am glad you are one too.